Halloween has totally invaded Fortnite Battle Royale this week. Spooky things are happening as the Fortnitemares Limited Time Event has kicked off. Zombie Cube Monsters have started to attack players and a ton of new Halloween-themed items are now available. With this Halloween-themed event comes four special Fortnitemares challenges that are only available for a limited time. These festive activities include killing some Cube Monsters, dancing for gargoyle statues, and a wide variety of other creepy deeds to complete. These challenges are certainly worth doing as they not only grant experience but also some special spooky rewards that can’t be found anywhere else in the game. For the most part, these are pretty standard challenges that are easy to complete. Unfortunately, they might take you a bit and since the Fortnitemares event is only happening for a limited period of time, you aren’t going to want to waste a moment getting started. Since the Fortnitemares challenges don’t require fighting other players, you should get a group together and do these challenges in squads so you have the most people on your team. The first of the Fortnitemares challenges is to destroy Cube Monsters. These are the new zombie-like creatures that have previously existed in the Save the World PvE mode of Fortnite. They can be found in the Corrupted Areas around the Battle Royale map, another part of the challenge we’ll get to in a moment. 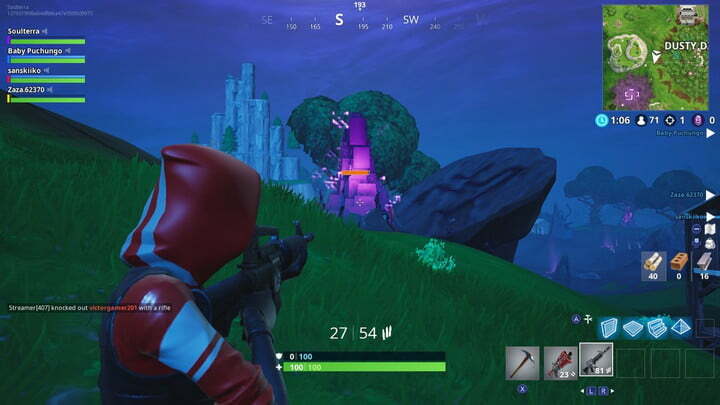 Look for are the huge cube fragments that are spawning in the game. These are different from the smaller ones that already existed and turn you into a ghost. The fragments you’re looking for spawn the Cube Monsters as you come close. There are a few different variants of the monsters, too., that include smaller, faster ones and larger ones with harder hits and more health. The more monsters you kill, the more challenging this task becomes. You have to kill at least 200 of the zombies in order to complete the first task. That’s a lot of zombies, and even though they go down in just a few hits, it’s a time-consuming task that can (and most likely will) take you and your squad several matches to complete. This is because you also have to worry about other players. Alone, I was able to take down around 50 zombies before getting killed so it is imperative that you tackle this with a team or else you will likely have to play several matches. We also recommend that you only do this part of the challenge with assault rifles or pistols. That’s because the first three of the four Fortnitemares challenges are intricately tied together. This next part asks you to deal at least 5,000 damage to Cube Monsters with only assault rifles and pistols. This is why we recommended that you use only those types of weapons during the first challenge. Despite having four parts, you can complete both of these Fortnitemares challenges at the same time. As such, you are going to want to focus on collecting assault rifles and pistols before heading to one of the Corrupted Areas to fight the Cube Monsters. Though pistols are included, we actually recommend you stick to assault rifles. The normal one, burst, and suppressed will all do you good in this second part of the challenge. While 5,000 damage is a lot, this part of the Fortnitemares Challenges is a whole lot easier than the first one. Even though we only killed around 50 zombies in our first Fortnitemares match, that was more than enough to complete the second challenge. Worried about ammo? That’s not going to be a problem. Killing zombies causes them to drop ammo and other items like medkits for your team. Simply back off, collect ammo, and heal up as you fight. Have your teammates cover you and vice versa. We suggest that you have multiple assault rifles in your inventory so you can alternate between them in sticky situations and don’t waste time reloading. The Cube Monsters can quickly overwhelm you with numbers so watch out. Like the first two, this third part of the challenge is connected directly to the others. As you’re visiting Corrupted Area to fight the Cube Monsters, you’ll already be progressing towards completing this third part of the Fortnitemares challenges. Unfortunately, you have to visit all seven of them and not just one. This final Fortnitemares challenge is a callback to the dance under different streetlights one. It requires you to dance in front of five different gargoyle statues. Creepy music plays when you’re near a statue so listen out for it. Once you’ve found one, simply do your favorite dance emote and you’ll be good to go. There are actually more than five gargoyles on the Battle Royale map but there are five we recommend that you visit. These areas are close together so it’s possible (but not required) to complete all five of them in a single match. Also, these areas aren’t near Corrupted Areas or popular locations so you are less likely to run into trouble. Like the multi-stage challenge, you’ll get a reward for every Fortnitemares challenge you complete. For completing the first challenge that tasks you with killing 200 Cube Monsters, you get 500 experience points. Similarly, damaging the monsters with assault rifles and pistols will net you another 500 experience points. Finally, visiting Corrupted Areas and dancing in front of five different gargoyle statues will also reward you with 500 experience points each. In total, that’s 2,000 experience points, enough that it will most likely level you up at least once. That’s not all, though. Part one of the Fortnitemares challenges will reward you with the fiery sticker emote that you can show off to teammates and enemies. This emote can’t be found anywhere else so quickly complete these challenges so you don’t miss out.